Historically, encountering air was considered to be a challenge while performing sonographic studies. However, it is now known that studying and understanding the artefacts produced by air can provide useful information for diagnosis and treatment. Most of the airway structures for assessment are superficial and are found within 5 cm from the skin. Therefore, a linear probe with a frequency of 5–15 MHz is most often adequate. A low-frequency (1–5 MHz) curvilinear probe is ideal for investigating areas of the tongue, submandibular and supraglottic regions. 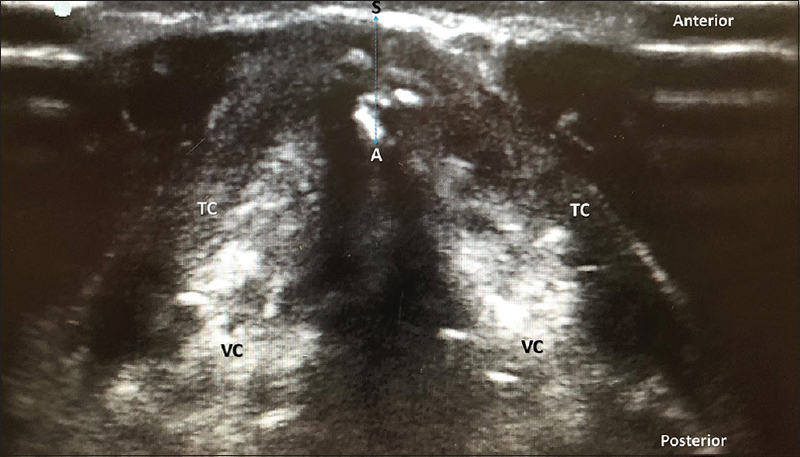 Conventional ultrasound (US) can identify structures from below the chin up to mid-trachea, as well as into the pleural spaces, areas which until recently could be studied in detail only by computerised tomographic (CT) scans. Thus, ultrasonography provides a point-of-care, simple and radiation-free method of airway assessment. Sonographic assessment of the airway has grown a long way and is now able to provide useful information to the anaesthesiologists. This review focuses on the evidence available for the use of US in airway assessment and for performing procedures. The assessment of vocal cords and laryngeal structures is a dynamic study that takes place in two phases: during quiet respiration and deglutition. Ultrasonography of the airway was recognised as a useful repertoire in the difficult airway armamentarium for over a decade now. The relationships of various structures, their distances and the angles they form with each other could be a potential marker for predicting difficult airway. These could also be used to correlate with Mallampati or Cormack–Lehane (CL) scores. However, the results of several studies are largely controversial. US was found to be equivalent to magnetic resonance imaging (MRI) assessment of pre-tracheal fat thickness with the added advantage of being cheaper, faster and easily available. Ezri et al. investigated the role of US in predicting difficult airway in obese Israeli population by measuring the distance from skin to trachea at various levels on the anterior neck. They found that among the predictors studied by them, quantification of soft-tissue mass in front of the vocal cord and suprasternal areas could differentiate patients who could be easily intubated from those who could not. On the other hand, Komatsu et al. did not find pre-tracheal soft-tissue thickness as being predictive of difficulty in intubation in American population. The ability to visualise hyoid bone in the sublingual view is considered predictive of lower CL scores and easier intubation. In addition, anterior neck soft-tissue thickness at the level of anterior commissure, thyrohyoid membrane and hyoid bone are also considered to be independent predictors of difficult airway [Figure 1], [Figure 2], [Figure 3], [Figure 4]. The pre-epiglottic space (pre-E) thickness measured anterior to the thyrohyoid membrane was recently found to be a better predictor of difficult laryngoscopy than that measured at the level of the vocal cords. However, the cut-off values derived were different in each of these studies. A value of 2.54 cm was predictive of a laryngoscopic view of at least CL 2b by Falcetta et al. This was supported by another recent study which found the thickness of 18 mm at the level of thyrohyoid membrane among other measurements to be more predictive of difficult airway. The cut-off values for this thickness of anterior neck at the level of the thyrohyoid membrane vary between 2.75 and 2.8 cm. The ratio of pre-E and E-VC (distance from epiglottis to vocal cords) may also have a role in predicting higher CL grading [Figure 5]. Several sonographic parameters, such as soft-tissue thickness anterior to the trachea, tongue base width, volume and cross-sectional area of the tongue, thickness of the lateral pharyngeal wall, hyomental distance ratio (HMDR) and pre-epiglottic space have been considered useful for prediction of difficult airway [Figure 6] and [Figure 7]. A combination of soft-tissue thickness on the anterior aspect of the trachea (at three levels) and the neck circumference (>50 cm) and HMDR <1.1 on US (ratio of hyomental distance in the neutral and hyperextended neck) correlated with difficult laryngoscopy in morbidly obese patients. The ratio of tongue base width and pharyngeal wall thickness was found to be associated with obstructive sleep apnoea (OSA). In patients with sleep apnoea, US visualisation of the approximation of tongue base posterior and inferiorly toward the hypopharynx correlated with airway obstruction. Intraoral sublingual approach using visibility of the hyoid bone has been suggested as a surrogate to predict difficult airway. Airway evaluation to predict OSA revealed that the distance between lingual arteries, lateral pharyngeal wall thickness and geniohyoid muscle thickness (GMT) correlated well with severe OSA, with GMT showing the strongest correlation. In a review of ten studies with the outcome variable of poor CL grade, 114 patients among 681 patients were found to correlate with difficult laryngoscopic views. Significance for sonographic prediction of difficult laryngoscopy occurred at three locations: mentohyoid distance (52.6 ± 5.8 mm [P < 0.01]), anterior tissue at the hyoid bone (16.9 mm [95% confidence interval (CI): 11.9–21.9] and 15.9 ± 2.7 mm [P < 0.0001]) and the thyrohyoid membrane (34.7 mm [95% CI: 28.8–40.7] and 23.9 ± 3.4 mm [P < 0.0001] and 28.25 ± 4.43 mm [P < 0.001]). However, the vocal cord and sternal notch levels had conflicting significance. Limitations of the studies included heterogeneous populations and lack of standard scanning protocols. The sonographic HMDR of 1–1.05 was found to be predictive of difficult airway in a study of 12 obese and morbidly obese patients. However, not all studies have supported the usefulness of this form of US assessment for predicting difficult laryngoscopy. There is no concurrence in the correlation between scoring systems and pre-epiglottic space or E-VC or their ratios. US is useful in localising and evaluating masses and/or obstruction in the airway. This can be helpful in preoperative planning of airway management. The potential of US for this use was recognised as early as three decades ago. US can also be used to evaluate the epiglottis, planning airway management by evaluating the airway from the tongue to the thyroid cartilage, the vallecula and the pyriform fossa and in assessing the mobility of vocal cords. The conventional method of evaluating the vocal cords and its movement is by indirect laryngoscopy or telelaryngoscopy. This may not be feasible in many situations as it requires trained personnel. US can be used to evaluate the cords before surgery on thyroid or other neck structures is performed. Kundra et al. 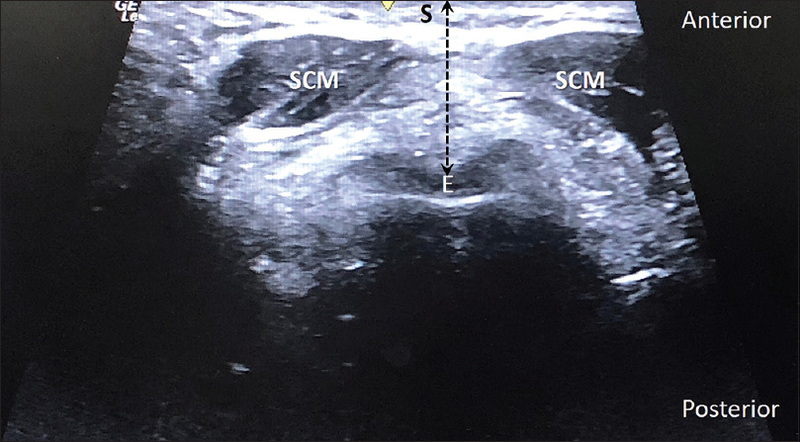 reported a post-thyroidectomy case wherein nerve injury could be diagnosed in the immediate postoperative period by assessing the vocal cord movement on bedside US, thus concluding that superior and recurrent laryngeal nerve palsy can be detected early. 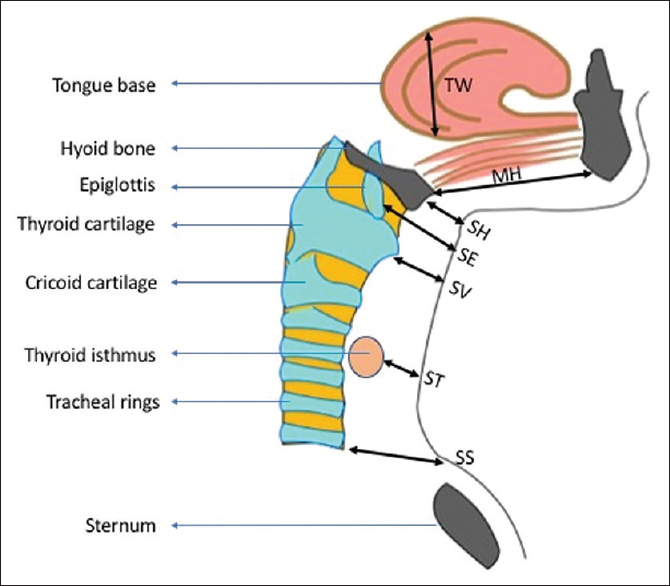 Similarly, correlation between vocal cord asymmetry (as identified on US in patients who had undergone thyroid surgery) and the development of voice changes in the postoperative period has also been observed. The rate of vocal fold visualisation and accuracy of US diagnosis of vocal fold palsy are better in females when compared to males. 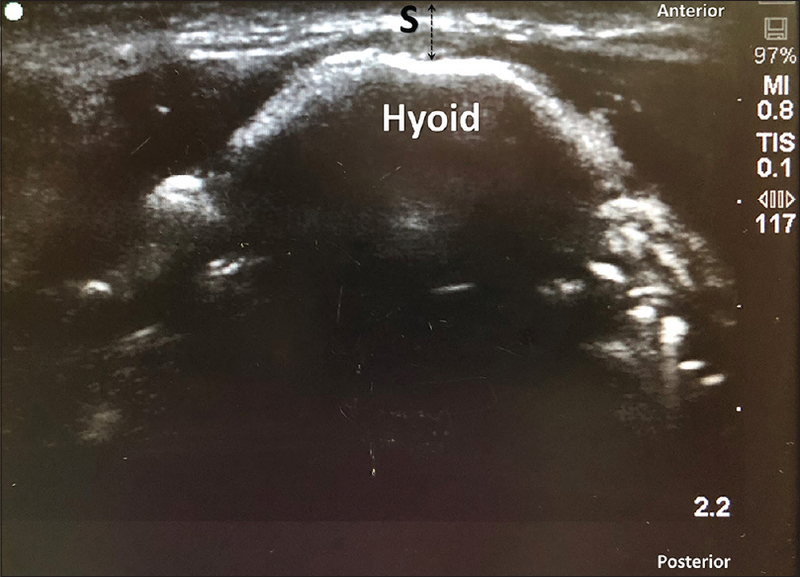 US can reliably diagnose vocal cord paralysis postoperatively in patients undergoing thyroid and parathyroid surgery and can be used as a screening tool with further laryngoscopic evaluation limited to those with asymmetrical cord movement. There is a high correlation between US-based and laryngoscopy-based evaluation of vocal cord function [Figure 8]. US can also differentiate solid and cystic lesions on the vocal fold. Similarly, airway abscesses may also be detected to aid in the decision to perform awake fibreoptic-aided intubation. Airway of patients with severe trismus can be evaluated noninvasively before performing a nasal intubation. Furthermore, in patients planned for retromolar intubation, the retromolar space can be examined to identify contraindications for nasal intubation. Benign vocal cord lesions such as cysts, polyps and papillomatosis can be identified with high accuracy in paediatric patients with translaryngeal US. Furthermore, ultrasonographic appearance of subglottic haemangioma, laryngeal stenosis and cysts, papillomas and pharyngeal pouch are well described. Studies have also demonstrated a better correlation between subglottic diameter measurement and correct ETT size than age-based formulae.,,, This is true for both cuffed and uncuffed tubes. Further, the technique is easy to learn and the procedure time is short. The impact of this advantage is significant in the paediatric age group wherein complications such as airway trauma and tracheal stenosis are more common with bigger tubes or repeated attempts at intubation. An undersized tube may result in poor ventilation owing to air leaks. Kim et al. derived and validated a formula from US-based measurement for ETT selection. Their data inform that the correlation was very good in children 12 months of age and older and not very good in those <12 months. This was supported by another study by Bae et al. who concluded that though US-based measurement for ETT selection resulted in better correlation, the success rate of selecting a correct size tube did not exceed 60% [Figure 9]. The correct size of double-lumen tubes (DLT) can also be selected based on the outer diameter of trachea just above the sternoclavicular joint using US. The measurements obtained by US correlated well with CT scan measurements of the trachea. Three-dimensional US can be used to reconstruct the subglottic space with the added advantage that unlike in conventional US, the posterior wall can also be assessed. Real-time visualisation of ETT passing the trachea in suprasternal view reliably detects proper tracheal intubation while a hyperechoic line deep to the trachea, called the double-tract sign, indicates oesophageal intubation. The oesophagus can be seen to the left of the trachea [Figure 10]. Chou et al. 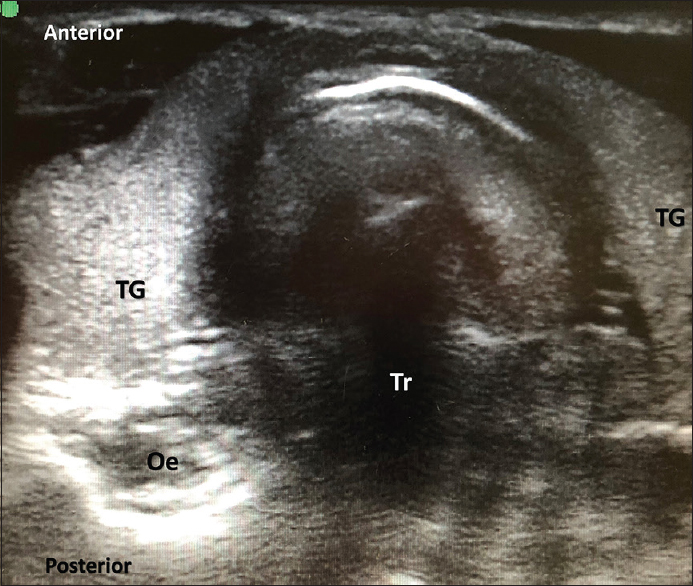 described a method for this called the tracheal rapid US examination for assessing successful tracheal intubation by placing the US probe transversely on the trachea in the suprasternal area. Bilateral diaphragmatic or pleural slide is also taken as surrogate markers of correct tube placement., Using US for confirming the success of intubation has several advantages. Unlike ETCO2 which is the gold standard, there is no need to wait for 4–5 breaths until the appearance of the capnographic waveform. Similarly, it does not rely on cardiac output and so can be used in patients with pulmonary embolism or during cardiac arrest. Several studies have shown high specificity and sensitivity for this method.,,, A meta-analysis that pooled data for 969 patients identified sensitivity and specificity of 0.98 (CI: 0.97–0.99) and 0.98 (CI: 0.95–0.99), respectively. The authors demonstrated that US was able to detect ETT placement earlier than either ETCO2 or routine clinical methods. Another meta-analysis of 12 studies on the use of US for the detection of correct placement of ETT concluded that oesophageal intubation could be detected with a high degree of accuracy. The use of US to detect the correct placement of DLT with lung isolation has been tried. DLT placement was correctly detected even in the presence of pneumothorax. This method may have useful implications in emergency situations. However, the disadvantage with US-based evaluation is that visualisation may be hampered in the presence of subcutaneous emphysema, oedema or excessive fat. Interestingly, confirmation of laryngeal mask airway (LMA) placement has also been tried by obtaining a transverse tracheal view at the suprasternal level and has shown to correlate well with fibreoptic view. In addition, displacement of LMA and cause for interference in the placement of LMA can also be identified. Several procedures on the trachea can be performed using US guidance. It provides a fast, easy and reliable method of evaluation. It is especially useful in patients with altered neck anatomy and obesity. US is useful in localising the trachea and the site for performing tracheostomy. This prevents several potential complications: pleura can be visualised by US to avoid pneumothorax; Doppler flow can detect vessels, thus preventing vessel injury or haemothorax and tracheal rings can be accurately localised, thereby avoiding cricoid/first tracheal ring incision and the resulting stenosis, especially in children. US guidance increases the safety and ease of performing percutaneous dilatational tracheostomies (PDTs). US enables visualisation and selection of intercartilaginous membrane, tracheal midline, thyroid isthmus and vascular structures. 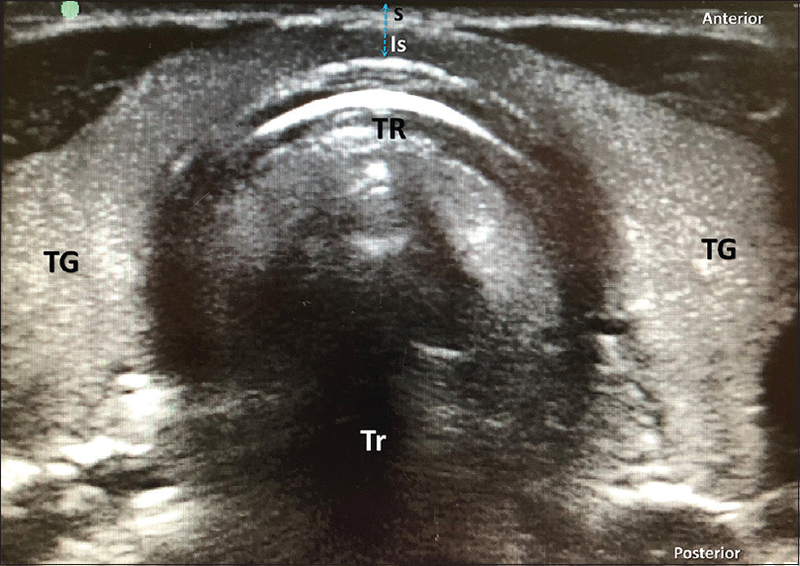 In a review article published by Rudas, three studies have reported a 23%–50% rate of change in the site of insertion for PDT after US assessment of the anterior neck due either to the presence of thyroid isthmus, a vessel or tracheal deviation. Hatfield et al. reported the presence of anterior jugular vein in about half the patients, and four patients had abnormal carotid artery courses which rendered PDT unsafe. Surgical tracheostomy was performed subsequently on these patients. The blinking frog sign has been described recently which refers to the presence of vasculature in the pre-tracheal area and if seen in the transverse view is best avoided. In conditions with altered neck anatomy and cervical spine immobiliser and in the obese, US can be of immense help in decreasing complications and morbidity. Bronchoscopic transillumination is unreliable in obese patients. Sustec et al. in their autopsy study of 26 cadaver tracheas found that those who had a PDT inserted blindly had more cranially placed tubes (between the cricoid and the first tracheal ring); there were no misplaced tubes in the trachea of patients who underwent PDT under US guidance. US also estimates the distance from the skin to the trachea and therefore can help in preventing perforation of the posterior tracheal wall. The incidence of developing hypercarbia is significantly higher in patients undergoing PDT under continuous bronchoscopic guidance when compared to PDT done under US guidance. Cricothyroidotomy is often performed as an emergency life-saving procedure in situations where the patient cannot be oxygenated or intubated. It is considered as one of the core skills for an anaesthetist. US assists in the accurate localisation of the cricothyroid membrane (CTM). Three different techniques of identifying this structure by the landmark method had a success rate of 46%–66% only, probably due to equipment or procedural faults. Failure to correctly detect this structure can be fatal during resuscitation. The success rate of correctly identifying the CTM by palpatory method varies from 39% to 32% when compared to the accuracy obtained by US., Pre-procedure US can help in locating anatomical structures and abnormal vasculature in addition to the ability to measure the distance for insertion. There is little evidence to demonstrate its use in real-time scenarios of complete ventilation failure. Real-time CTM needle insertion under US guidance has also been described in 16 patients who underwent emergency cricothyroidotomy in view of impending airway obstruction after all other measures to secure airway failed. These patients either had severe maxillofacial injuries or cervical spine immobilisers in place. US was also used to locate the landmark in the presence of Ludwig's angina before performing cricothyroidotomy [Figure 11]. Successful US-guided retrograde intubation has also been described in a patient with haemorrhaging friable tumour in the airway presenting with stridor. Anatomical structures relevant to airway block (superior laryngeal nerve) can be visualised in 81% of patients. However, the nerve itself is not visualised. Post-extubation stridor (PES) may be a result of several conditions, namely laryngotracheal oedema, trauma, mucosal injury and airway granulomas. However, these are often recognised when complications such as stridor or reintubation occur following extubation. Several studies analysed the utility of US in predicting successful extubation, especially for patients on ventilators in the intensive care unit. These studies compared the air column width (ACW) at the level of the CTM before and after ETT cuff deflation as a surrogate for the conventional leak test (CLT). Although earlier studies found low sensitivity and specificity of both CLT and US methods in predicting PES,, a few recent studies have shown better results.,,, In a study involving 400 children out of whom 44 developed PES, a high level of sensitivity (93%), specificity (83%) and accuracy (91%) was demonstrated if the difference between the ACW before and after cuff deflation was <0.8 mm. In adults, an ACW difference of 0.9 mm was significant in predicting PES [Figure 12]. Ultrasonography has proven to be useful in managing the airway, especially when airway anatomy is distorted. Repeated dynamic assessments can be performed, and the accuracy is comparable to CT and MRI of the airway with the added benefit of being real time. It can be used immediately before induction of anaesthesia to assess airway anatomy as well as predict difficult airway. It improves the safety of performing percutaneous tracheostomies and cricothyroidotomies. However, its overambitious use cannot be recommended in situations where other gadgets have proven to be superior. Ezri T, Gewürtz G, Sessler DI, Medalion B, Szmuk P, Hagberg C, et al. Prediction of difficult laryngoscopy in obese patients by ultrasound quantification of anterior neck soft tissue. Anaesthesia 2003;58:1111-4. Komatsu R, Sengupta P, Wadhwa A, Akça O, Sessler DI, Ezri T, et al. Ultrasound quantification of anterior soft tissue thickness fails to predict difficult laryngoscopy in obese patients. Anaesth Intensive Care 2007;35:32-7. Hui CM, Tsui BC. Sublingual ultrasound as an assessment method for predicting difficult intubation: A pilot study. Anaesthesia 2014;69:314-9. Adhikari S, Zeger W, Schmier C, Crum T, Craven A, Frrokaj I, et al. Pilot study to determine the utility of point-of-care ultrasound in the assessment of difficult laryngoscopy. Acad Emerg Med 2011;18:754-8. Falcetta S, Cavallo S, Gabbanelli V, Pelaia P, Sorbello M, Zdravkovic I, et al. Evaluation of two neck ultrasound measurements as predictors of difficult direct laryngoscopy: A prospective observational study. Eur J Anaesthesiol 2018;35:605-12. Parameswari A, Govind M, Vakamudi M. Correlation between preoperative ultrasonographic airway assessment and laryngoscopic view in adult patients: A prospective study. J Anaesthesiol Clin Pharmacol 2017;33:353-8. Bilici S, Engin A, Ozgur Y, Ozlem Onerci C, Ahmet Gorkem Y, Aytul Hande Y, et al. Submental ultrasonographic parameters among patients with obstructive sleep apnea. Otolaryngol Head Neck Surg 2017;156:559-66. Fulkerson JS, Moore HM, Anderson TS, Lowe RF Jr. Ultrasonography in the preoperative difficult airway assessment. J Clin Monit Comput 2017;31:513-30. Wojtczak JA. 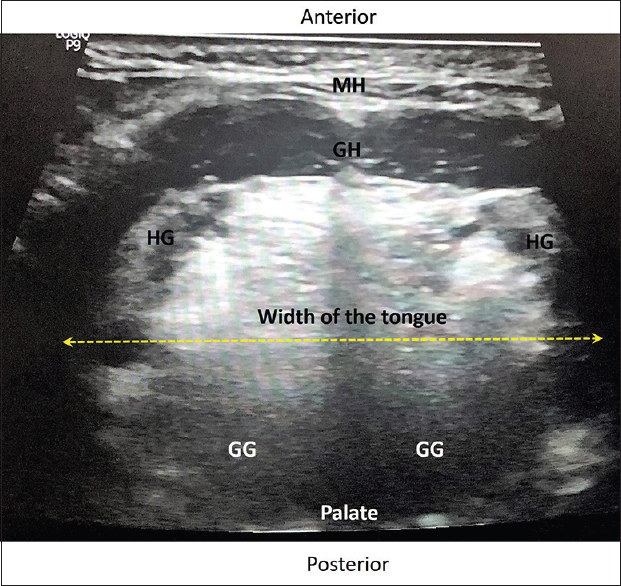 Submandibular sonography: Assessment of hyomental distances and ratio, tongue size, and floor of the mouth musculature using portable sonography. J Ultrasound Med 2012;31:523-8. Hatfield A, Bodenham A. Ultrasound: An emerging role in anaesthesia and intensive care. Br J Anaesth 1999;83:789-800. Kundra P, Kumar K, Allampalli V, Ananthkrishnan R, Gopalakrishnan S, Elangovan S, et al. Use of ultrasound to assess superior and recurrent laryngeal nerve function immediately after thyroid surgery. Anaesthesia 2012;67:301-2. Wang CP, Chen TC, Yang TL, Chen CN, Lin CF, Lou PJ, et al. Transcutaneous ultrasound for evaluation of vocal fold movement in patients with thyroid disease. Eur J Radiol 2012;81:e288-91. Bisetti SM, Segala F, Zappia F, Albera R, Ottaviani F, Schindler A. Non-invasive assessment of benign vocal fold lesions in children by means of ultrasonography. Int J Pediatr Otorhinolaryngol 2009;73:1160-2. Shibasaki M, Nakajima Y, Ishii S, Shimizu F, Shime N, Sessler DI, et al. Prediction of pediatric endotracheal tube size by ultrasonography. Anesthesiology 2010;113:819-24. Lakhal K, Delplace X, Cottier JP, Tranquart F, Sauvagnac X, Mercier C, et al. The feasibility of ultrasound to assess subglottic diameter. Anesth Analg 2007;104:611-4. Bae JY, Byon HJ, Han SS, Kim HS, Kim JT. Usefulness of ultrasound for selecting a correctly sized uncuffed tracheal tube for paediatric patients. Anaesthesia 2011;66:994-8. Schramm C, Knop J, Jensen K, Plaschke K. Role of ultrasound compared to age-related formulas for uncuffed endotracheal intubation in a pediatric population. Paediatr Anaesth 2012;22:781-6. Kim EJ, Kim SY, Kim WO, Kim H, Kil HK. Ultrasound measurement of subglottic diameter and an empirical formula for proper endotracheal tube fitting in children. Acta Anaesthesiol Scand 2013;57:1124-30. Sustić A, Miletić D, Protić A, Ivancić A, Cicvarić T. Can ultrasound be useful for predicting the size of a left double-lumen bronchial tube? Tracheal width as measured by ultrasonography versus computed tomography. J Clin Anesth 2008;20:247-52. Or DY, Karmakar MK, Lam GC, Hui JW, Li JW, Chen PP, et al. Multiplanar 3D ultrasound imaging to assess the anatomy of the upper airway and measure the subglottic and tracheal diameters in adults. Br J Radiol 2013;86:20130253. Thomas VK, Paul C, Rajeev PC, Palatty BU. Reliability of ultrasonography in confirming endotracheal tube placement in an emergency setting. Indian J Crit Care Med 2017;21:257-61. Chou HC, Tseng WP, Wang CH, Ma MH, Wang HP, Huang PC, et al. Tracheal rapid ultrasound exam (T.R.U.E.) for confirming endotracheal tube placement during emergency intubation. Resuscitation 2011;82:1279-84. 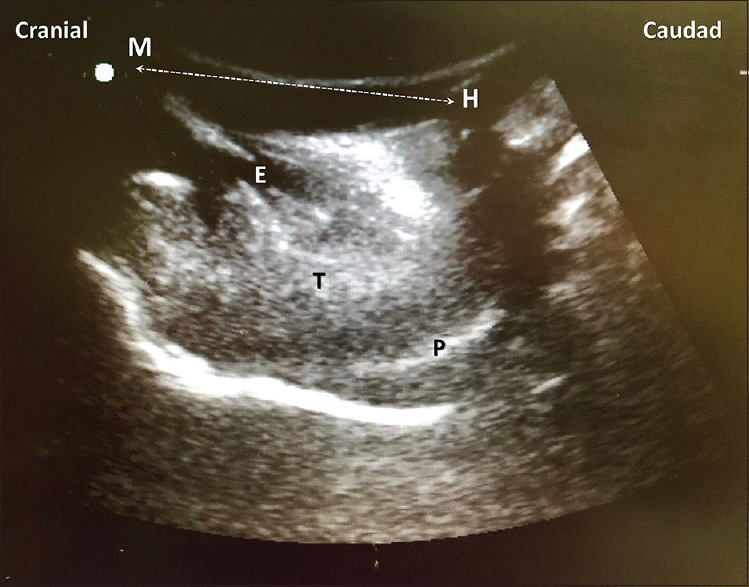 Weaver B, Lyon M, Blaivas M. Confirmation of endotracheal tube placement after intubation using the ultrasound sliding lung sign. Acad Emerg Med 2006;13:239-44. Hosseini JS, Talebian MT, Ghafari MH, Eslami V. Secondary confirmation of endotracheal tube position by diaphragm motion in right subcostal ultrasound view. Int J Crit Illn Inj Sci 2013;3:113-7. Osman A, Sum KM. Role of upper airway ultrasound in airway management. J Intensive Care 2016;4:52. Ramsingh D, Frank E, Haughton R, Schilling J, Gimenez KM, Banh E, et al. Auscultation versus point-of-care ultrasound to determine endotracheal versus bronchial intubation: A diagnostic accuracy study. Anesthesiology 2016;124:1012-20. Zamani Moghadam H, Sharifi MD, Rajabi H, Mousavi Bazaz M, Alamdaran A, Jafari N, et al. Screening characteristics of bedside ultrasonography in confirming endotracheal tube placement; a diagnostic accuracy study. Emerg (Tehran) 2017;5:e19. Álvarez-Díaz N, Amador-García I, Fuentes-Hernández M, Dorta-Guerra R. Comparison between transthoracic lung ultrasound and a clinical method in confirming the position of double-lumen tube in thoracic anaesthesia. A pilot study. Rev Esp Anestesiol Reanim 2015;62:305-12. Das SK, Choupoo NS, Halder R, Lahkar A. Transtracheal ultrasound for verification of endotracheal tube placement: A systematic review and meta-analysis. Can J Anaesth 2015;62:413-23. Chou EH, Dickman E, Tsou PY, Tessaro M, Tsai YM, Ma MH, et al. Ultrasonography for confirmation of endotracheal tube placement: A systematic review and meta-analysis. Resuscitation 2015;90:97-103. Saporito A, Lo Piccolo A, Franceschini D, Tomasetti R, Anselmi L. Thoracic ultrasound confirmation of correct lung exclusion before one-lung ventilation during thoracic surgery. J Ultrasound 2013;16:195-9. Park SC, Ryu JH, Yeom SR, Jeong JW, Cho SJ. Confirmation of endotracheal intubation by combined ultrasonographic methods in the emergency department. Emerg Med Australas 2009;21:293-7. Gupta D, Srirajakalidindi A, Habli N, Haber H. Ultrasound confirmation of laryngeal mask airway placement correlates with fiberoptic laryngoscope findings. Middle East J Anaesthesiol 2011;21:283-7. Kristensen MS, Teoh WH, Graumann O, Laursen CB. Ultrasonography for clinical decision-making and intervention in airway management: From the mouth to the lungs and pleurae. Insights Imaging 2014;5:253-79. Rudas M. The role of ultrasound in percutaneous dilatational tracheostomy. Australas J Ultrasound Med 2012;15:143-8. Tuinman PR, van Westerloo D, Slot S, Tuow HRW. The 'blinking frog' ultrasound sign establishes the presence of pretracheal vasculature. Intensive Care Med 2018. https://doi.org/10.1007/s00134-018-5435-y. Sustić A, Kovac D, Zgaljardić Z, Zupan Z, Krstulović B. Ultrasound-guided percutaneous dilatational tracheostomy: A safe method to avoid cranial misplacement of the tracheostomy tube. Intensive Care Med 2000;26:1379-81. Muhammad JK, Patton DW, Evans RM, Major E. Percutaneous dilatational tracheostomy under ultrasound guidance. Br J Oral Maxillofac Surg 1999;37:309-11. Reilly PM, Sing RF, Giberson FA, Anderson HL 3rd, Rotondo MF, Tinkoff GH, et al. Hypercarbia during tracheostomy: A comparison of percutaneous endoscopic, percutaneous Doppler, and standard surgical tracheostomy. Intensive Care Med 1997;23:859-64. Rajajee V, Fletcher JJ, Rochlen LR, Jacobs TL. Real-time ultrasound-guided percutaneous dilatational tracheostomy: A feasibility study. Crit Care 2011;15:R67. Rudas M, Seppelt I, Herkes R, Hislop R, Rajbhandari D, Weisbrodt L, et al. Traditional landmark versus ultrasound guided tracheal puncture during percutaneous dilatational tracheostomy in adult intensive care patients: A randomised controlled trial. Crit Care 2014;18:514. Rajajee V, Williamson CA, West BT. Impact of real-time ultrasound guidance on complications of percutaneous dilatational tracheostomy: A propensity score analysis. Crit Care 2015;19:198. Gobatto AL, Besen BA, Tierno PF, Mendes PV, Cadamuro F, Joelsons D, et al. Comparison between ultrasound- and bronchoscopy-guided percutaneous dilational tracheostomy in critically ill patients: A retrospective cohort study. J Crit Care 2015;30:220.e13-7. Bair AE, Chima R. The inaccuracy of using landmark techniques for cricothyroid membrane identification: A comparison of three techniques. Acad Emerg Med 2015;22:908-14. 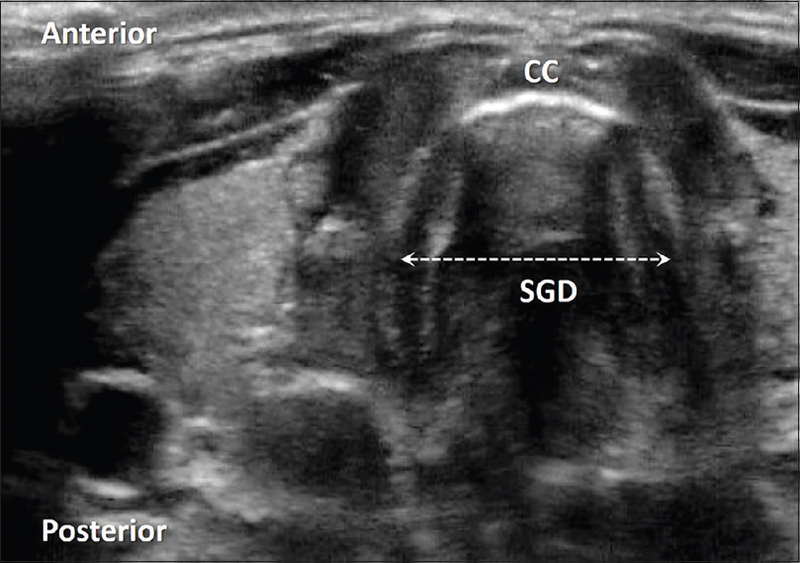 You-Ten KE, Desai D, Postonogova T, Siddiqui N. Accuracy of conventional digital palpation and ultrasound of the cricothyroid membrane in obese women in labour. Anaesthesia 2015;70:1230-4. Suzuki A, Iida T, Kunisawa T, Henderson JJ, Fujita S, Iwasaki H, et al. Ultrasound-guided cannula cricothyroidotomy. Anesthesiology 2012;117:1128. Ravi PR, Vijai MN, Shouche S. Realtime ultrasound guided percutaneous tracheostomy in emergency setting: The glass ceiling has been broken. Disaster Mil Med 2017;3:7. Narendra PL, Vishal NS, Jenkins B. Ludwig's angina: Need for including airways and larynx in ultrasound evaluation. BMJ Case Rep 2014;2014. pii: bcr2014206506. Vieira D, Lages N, Dias J, Maria L, Correia C. Ultrasound-guided retrograde intubation. Anaesthesia 2013;68:1075-6. Kristensen MS. Ultrasonography in the management of the airway. Acta Anaesthesiol Scand 2011;55:1155-73. Ding LW, Wang HC, Wu HD, Chang CJ, Yang PC. Laryngeal ultrasound: A useful method in predicting post extubation stridor. A pilot study. Eur Respir J 2006;27:384-9. Mikaeili H, Yazdchi M, Tarzamni MK, Ansarin K, Ghasemzadeh M. Laryngeal ultrasonography versus cuff leak test in predicting post extubation stridor. J Cardiovasc Thorac Res 2014;6:25-8. Patel AB, Ani C, Feeney C. Cuff leak test and laryngeal survey for predicting post-extubation stridor. Indian J Anaesth 2015;59:96-102. Venkategowda PM, Mahendrakar K, Rao SM, Mutkule DP, Shirodkar CG, Yogesh H, et al. Laryngeal air column width ratio in predicting post extubation stridor. Indian J Crit Care Med 2015;19:170-3. El Amrousy D, Elkashlan M, Elshmaa N, Ragab A. Ultrasound-guided laryngeal air column width difference as a new predictor for postextubation stridor in children. Crit Care Med 2018;46:e496-501. El-Baradey GF, El-Shmaa NS, Elsharawy F. Ultrasound-guided laryngeal air column width difference and the cuff leak volume in predicting the effectiveness of steroid therapy on postextubation stridor in adult. Are they useful? J Crit Care 2016;36:272-6.